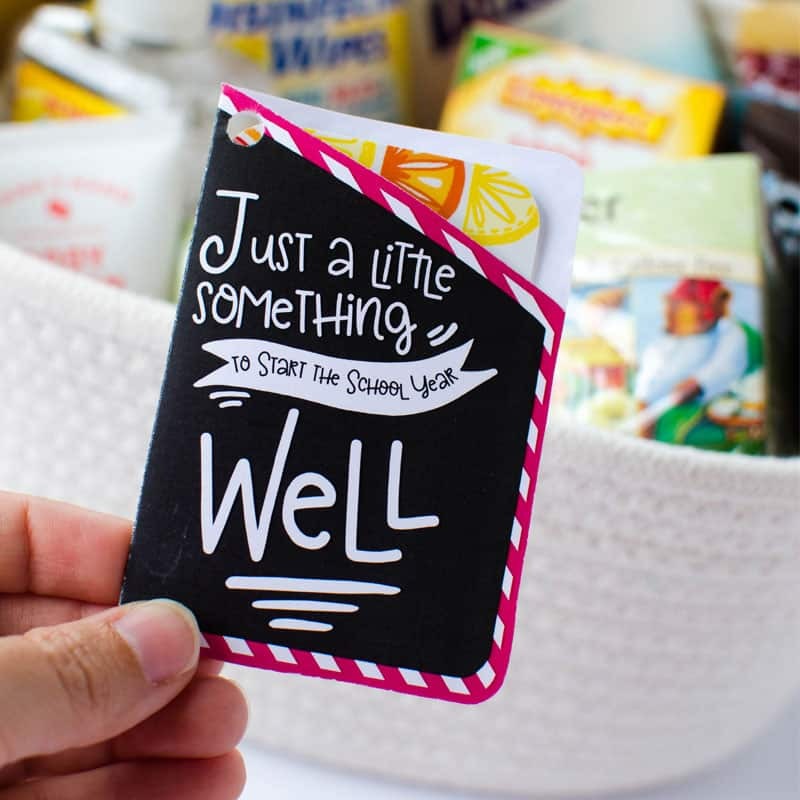 This simple DIY teacher survival kit is the ultimate back-to-school teacher gift idea. 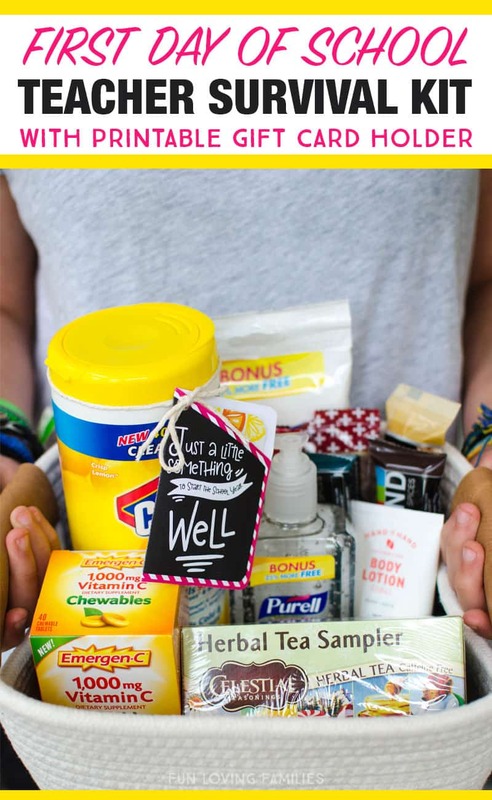 Be sure to view the entire post for lots of teacher survival kit ideas, plus a free printable to help pull it all together! We started gifting these to our teachers at the beginning of the school year last year. I had actually spent a year as a teacher assistant at my kids’ school and received a similar gift from a parent on the first day of school…and I loved it! I honestly used almost everything in the teacher survival kit that I received. One of the reasons the gift went over so well was because it was not only very thoughtful, but also full of practical and useful items. If you know your child’s teacher already, then you might already have some insights into their likes and dislikes. Definitely start there. But, even if you don’t know a lick about your child’s new teacher, there are plenty of ideas that will work for almost any teacher. Vitamin C – With so many germs coming in and out of the classroom, this one is a no-brainer. The teachers I know keep a pack of Vitamin C (like this) stashed in a cabinet and pass it around whenever the first signs of a sickness come on. Herbal Tea– I love this pack of herbal teas because there’s something for every person or every occasion, whether they need a mid-day pick-me-up or something calming to settle down with at the end of the day. Kind Bars– A sweet, protein packed snack, generally eaten toward the end of the school day when you just need something to get you through. 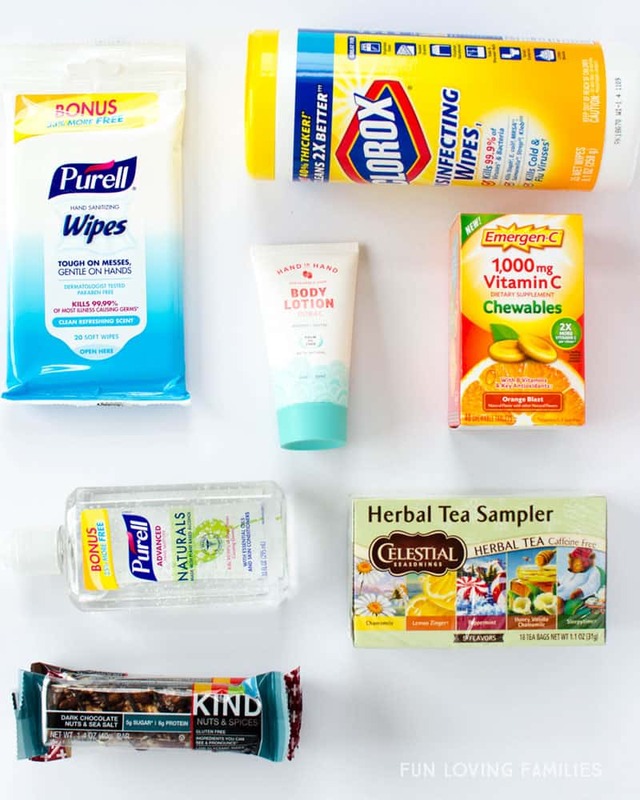 Lysol Wipes– Our teachers never seem to have enough of these. Everything gets wiped down constantly. Hand Lotion- A must-have after washing and sanitizing your hands all day long. Hand Sanitizer – More with the germs, but seriously, it’s a must have item in a classroom. Gift Card to Target– We included a small amount on a gift card to help our teacher with any last-minute items she might need for the classroom (or for herself!). Really, many of the items we included are things that teachers tend to ask for throughout the year anyway. Plus, we want our teachers to feel good! We had to throw some things in to help our teacher just get through the day and then relax a little at night. 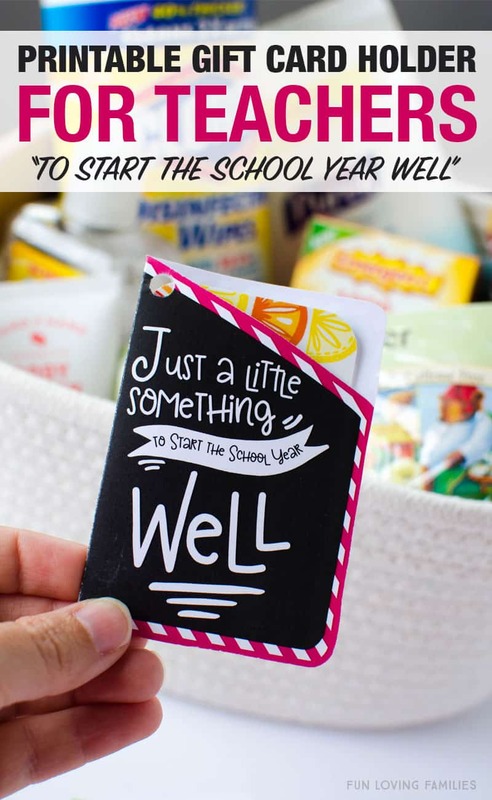 If you’d like to use the gift card holder I used for our first-day-of-school teacher gift, I’ve included the PDF download below. The download file has the card in four different color options, and it has a “From” section on the back. 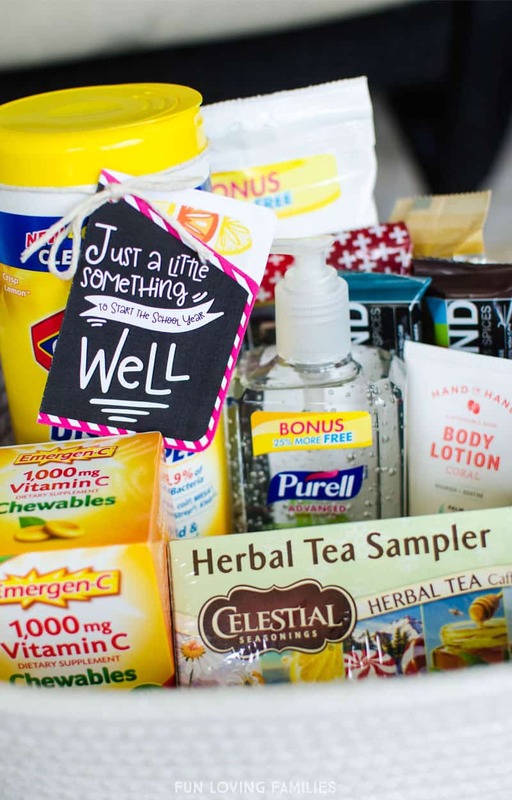 Looking for more Teacher Survival Kit Ideas? And finally, be sure to follow my Back to School Pinterest board for more wonderful ideas! 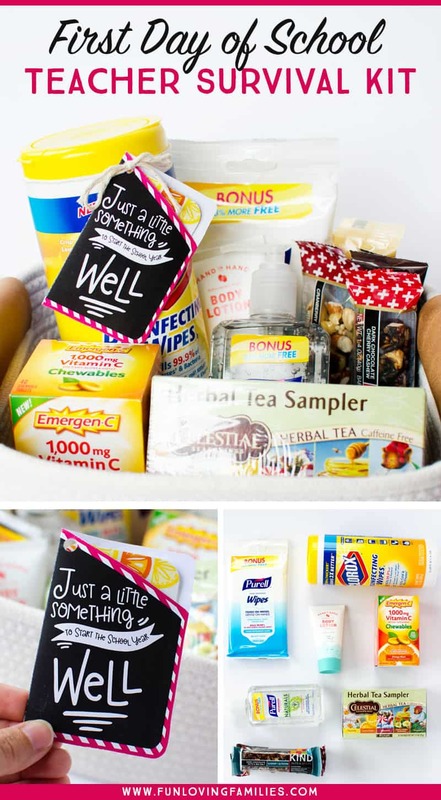 Awesome teacher survival kit DIY project. This gonna help me a lot. I like this DIY project. I want to get it to teach my kids. You can also find some ideas on dearlives.com. Hope you like it.